Product #20665 | SKU 023800-0001-110 | 0.0 (no ratings yet) Thanks for your rating! With Slide-Beam technology instantly alters the beam distance from spot to flood and vice versa. The Pelican 2380 LED Flashlight is a dual-purpose tactical light with flood and spotlight capabilities: A wide light beam illuminates your work area and a focused light beam will light-up long trails. Our sophisticated Slide-Beam technology instantly alters the beam distance from spot to flood and vice versa. Built-in battery level indicator ensures you will not be left in the dark. The compact size (16.4 cm), ultra bright 372 lumen output, and aerospace grade aluminum body equal high performance in a small package. 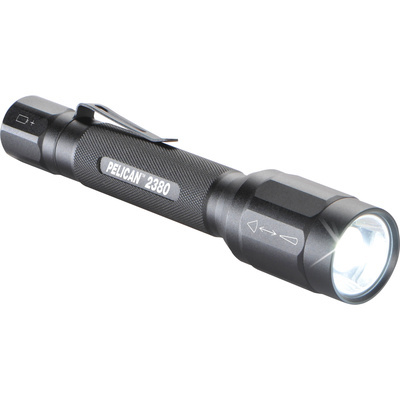 Built Pelican tough and guaranteed for life, the new 2380 LED Flashlight with slide beam technology gives you the lighting you need, when you need it. High, Strobe and Low light modes are available with a push of the tail button. It features a non-slip textured body for secure handling. The removable pocket clip offers alternative carry option.